Tuna is the best emergency food item. I can’t tell you how many times I’ve stared into my fridge with despair because I had no ready protein sources to feed to my hungry husband. Then I realize… TUNA!!! I always keep a few cans on hand in the pantry. 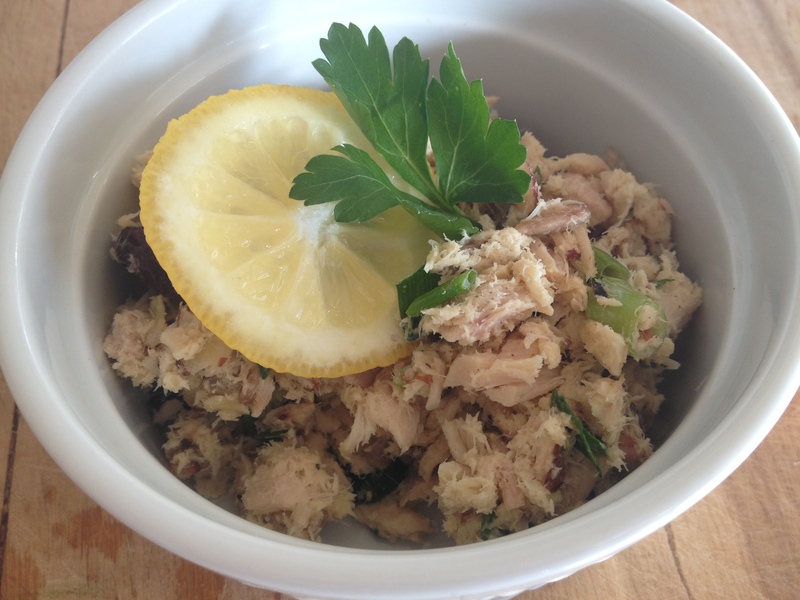 You can make so many things with tuna! You can shaped them into tuna burgers! You can put it on top of salads with lots of leftover veggies. You can eat it in romaine boats, scooped out heirloom tomatoes, or wrapped in collard leaves. You can mash it up with avocado, pesto, romesco, or homemade mayonnaise; add celery, onion, apples, spices, nuts…. you get the idea. Super versatile. In a medium-sized bowl, add nuts, cranberries, green onion. Drain the tuna and add to the bowl. Mix all together with mayo and seasonings. Add more or less seasonings depending on your taste. *I recommend buying raw sunflower seeds and sliced almonds, then toast them yourself in a hot cast iron skillet. Many roasted nuts have been roasted in canola oil or other industrial oils. This way, you can ensure a bit more freshness and avoid exposure to those oils. ** I also recommend unsalted tuna packed in water because you are able to control the quality and quantity of sea salt in your salad. Sometimes tuna is packed in olive oil and that olive oil could have been damaged during packaging, shipping, etc… Go water to be safe. That looks good! Will have to give it a try.